We all know that obesity is not just an issue in the United States-it's a worldwide epidemic. But the U.S. is leading the way. An estimated 36% of Americans over 20 are medically obese, while 70% are overweight. And we all know that our poor national diet: fast food, junk food, and processed foods, washed down with millions of gallons of sugary sodas, is a big part of the problem. But let's not forget about the other factor that's rapidly making us the fattest and least healthy country on the planet: inactivity. Call it whatever you like--lack of exercise, sedentary lifestyle, couch potato culture-it's the other reason our waistlines (and related healthcare costs) are growing. For example, if you have been diagnosed as obese (or know someone who has), how much vigorous exercise do you think you average per year? 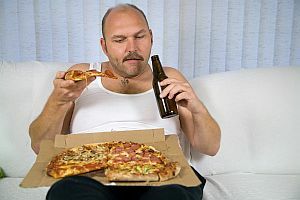 Would it surprise you to learn that a survey done on over 2,600 adults and presented in the Mayo Clinic Proceedings in December 2013 found the average obese American man gets only 3.6 hours of vigorous exercise per YEAR? And that the average obese American woman gets only ONE hour of vigorous exercise in the same period of time? Please remember as you're trying to digest these figures that when researchers use the term "vigorous" with regard to exercise performed by obese people, they include walking. These figures surprised even the researchers themselves. One of them, Edward Archer, from the National Obesity Research Center, describes his shock at learning that "They [obese Americans] are living their lives from one chair to another. We didn't realize we were that sedentary. There are some people who are vigorously active, but it's offset by the huge number of individuals who are inactive." The data for the study came from the American Heritage Time Use Study database, which consists of more than 50,000 diary days spanning 1965-2010. Physical activity was defined as the time engaged in general child care and playing with children, preparing meals, post-meal cleanup, housework, as well as participating in sports and exercise. There are many, many reasons for this much deadly inactivity, including increased computer use and TV watching. However, it is clear that women are more at risk than men and that mothers are particularly vulnerable. Mothers with older children reported an average increase in time sedentary time from 18 hours per week in 1965 to 25 hours in 2010, while mothers with young children increased their sedentary time from 17 hours per week to nearly 23 hours. This low-activity lifestyle was even more pronounced among women who were employed. The result of all this inactivity is that mothers today actually need to eat less food to maintain their weight, about 200 calories per day which is less than they did in 1965. But that's not what's happening. In reality, they're eating more. If you're thinking that this much inactivity is exaggerated or atypical, the study authors disagree. Archer says that the study subjects were living a typical life: "They drive their children to school, they sit at a desk all day long, they may play some video games and they go to sleep." And all of this inactivity is killing them, increasing their risk of developing diabetes, heart disease, and many other life-threatening disorders. What is really required, the study authors say, is a complete reassessment of lifestyle and a renewed commitment to regular exercise. As little as 30 minutes of exercise five days a week can stop weight gain and drastically improve your health. And Archer reminds us that this doesn't have to be athlete-level exercise: "People don't understand that you don't have to go to the gym and lift weights and run marathons to have dramatic impacts on your body. Standing rather than sitting, walking rather than taking your car, they have huge impacts on your health over time." Researcher John Jakicic of the University of Pittsburgh agrees that small changes can make a huge difference: "Traditional exercise approaches are not the way to try to get obese people active-the barriers are just too great. However, we showed a number of years ago that encouraging multiple brief periods-five to 10 minutes two to three times per day-was an effective way to get individuals active initially. Once they started to become more active in this way, they started to add even more activity." So if you're obese -or even just overweight, please see your physician and ask for their help in setting up a regular exercise program. It'll help you lose weight and might also save your life. Interested in living a healthier life? Give us a call at (303) 776-6767 and find out how chiropractic care can help!